In the back of Room 500, the old GHS Language Lab now serving as the central hub of Innovation Lab, the whiteboard from our old office hangs in the back left corner. Like an artifact on display in a museum, it holds our notes from last year, a jumbled mess of writing that captures our final phase of research and design: our core beliefs scribbled in shorthand, a sketch of the physical space, and a series of end-of-the-year tasks delegated to each of the team members. As I sat in Room 500 and discussed the first Humanities project with students, I couldn’t help but notice how the research and planning we did last year echoes the work we expect of our students this year. Just as the team naturally gravitated toward different tasks based on our strengths, conducted research inspired by our individual interests, and worked together for a common goal, students are undergoing a similar process as they settle into their first project. One of the challenges of teaching in a project-based learning environment is understanding how to give students the structure and tools necessary for success while also encouraging independence and choice. At first, project-based learning may feel artificial, an educational simulation of what people do in the real world; the teacher assigns a project, students conduct research, the teacher models skills, and voilà, students create a polished finished product. But if the project is framed in the right light, the line between the classroom and the real world starts to blur. As I listened to students discuss their projects this week, I felt like we were finally approaching that line. In the project, which we’re calling “Modern Day Muckrakers,” students have chosen groups based on their interests. The topics are general–Poverty, Race, Foreign Policy, Workers’ Rights, Gender, Food and Environmental Regulation–but under the umbrella of each, students are responsible for learning terms that relate to both the Progressive Era and today. The goal of the project is for students to create an investigative journalism report which “educates and persuades,” the same goal of many Progressive Era reformers. What thinking looks like. 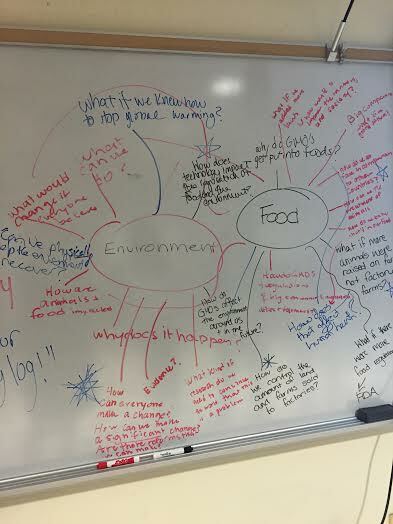 The Food and Environmental Regulation group brainstormed questions to help them focus their research. The project has an extensive list of requirements: Students have to define a current day problem in light of their research, interview an outside expert, find sources using the GHS database, write a textbook-style overview of their topic, propose a solution, and ultimately create a video with accompanying audio and visual elements, all based on a firm understanding of ethos, pathos, and logos. So, with the goals of the project in place, the teacher can just step back and let the kids figure it out themselves, right? Well, not exactly. It’s important to set up the right structure for students to be successful. Students must have deadlines, exemplars of the finished product, and clearly defined roles within their groups. 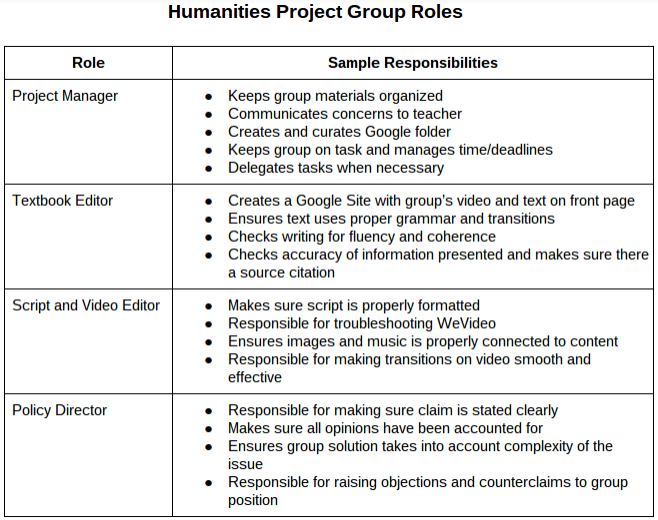 At the beginning of the week, I gave students a chart outlining group roles, including Project Manager, Script and Video Editor, Textbook Editor, and Policy Director. Each of these roles plays to a different expertise and it was interesting to see students get excited about the various tasks. One student chose Project Manager, saying, “I’m bossy.” Another student was nominated to be the Video Editor because, according to another student, “You make all those YouTube videos.” In another group, a student who has a passion for writing immediately raised her hand when we were discussing the responsibilities of the Textbook Editor. Students chose group roles based on their interests. They’re responsible for learning different skills and teaching their peers. Did every student immediately jump to take on a role? Of course not. But by the end of the project, every student will have experienced the rewards and challenges of being a leader and completed tasks for each of the project goals. Most importantly, they’ll be able to see how their individual contributions led to the creation of something special. Looking at the whiteboard in the back of Room 500, my initials next to a now unknown task thanks to an errant eraser, I can’t help but feel proud of the role I played in designing Innovation Lab. That feeling of satisfaction–a byproduct of hard work, collaboration, false starts, and changes in direction–is something you can’t teach; students have to experience it themselves. This is so good!! I really enjoy reading the blog posts innovation lab posts.